Teamsters across the country will honor the legacy of civil rights and labor leader Martin Luther King Jr. on Jan. 21, 2019. King actively supported the labor movement, frequently speaking to union audiences. He devoted his life to securing rights for minorities and eliminating segregation in society. King believed that the path to economic freedom and social justice were one and the same and strongly supported the labor movement. At present, due to the government shutdown, unions all over the world have been coming together rallying for Congress to “Call the Vote” and reopen the government to put more than 800,000 people back to work. King, always an advocate of working families, would have been standing shoulder to shoulder with the union members, clergy and community leaders demanding an end to the shutdown. “We are now faced with the fact that tomorrow is today. We are confronted with the fierce urgency of now. In this unfolding conundrum of life and history, there is such a thing as being too late. This is no time for apathy or complacency. This is a time for vigorous and positive action,” King said at Riverside Church in New York City in 1967. The Teamsters Union was an early supporter of King, donating money to his cause and sending supplies to marchers and other civil rights workers. Today, Teamsters across the country are committed to the union’s tradition of standing up for social justice. Through organizations like the Teamsters Human Rights Commission, Teamsters are able to carry on the legacy of Dr. King. 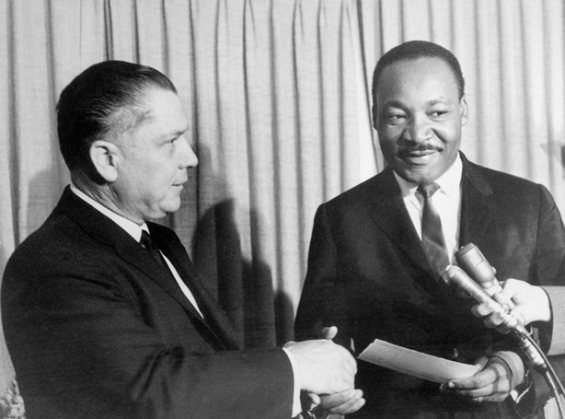 1965: Teamster General President James R. Hoffa with Dr. Martin Luther King, Jr.